Updated on Monday April 8th, 2019: It’s not unusual for companies to bundle their software programs at discount. 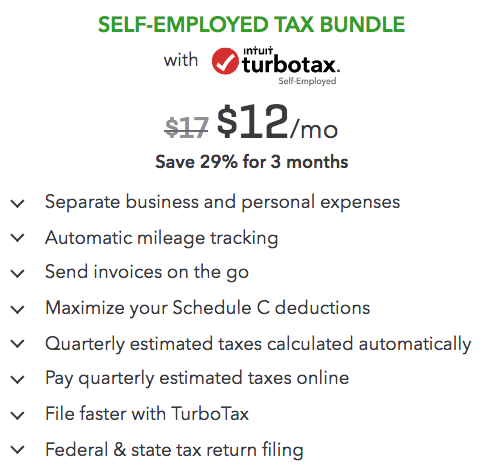 And although TurboTax has done away with their Quicken-TurboTax bundle (they sold off their Quicken brand a few years ago), the QuickBooks Self-Employed Tax Bundle is still available. Again for 2019, you can get Quickbooks for just $12.00/month for your first 3-months. And with it, you’ll be able to file your tax return with TurboTax Self-Employed (formally called Home & Business) once a year as part of your active subscription. Not a bad deal considering how much QuickBooks and TurboTax will cost you separately. 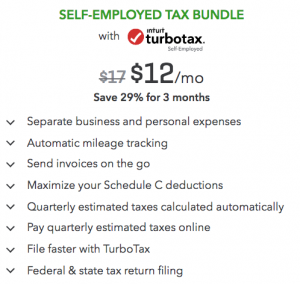 What are the benefits of the QuickBooks-TurboTax Self-Employed Tax Bundle? Time is what all of us small business owners never seen to have enough of. That’s why Intuit introduced tax integration into their QuickBooks products so that you don’t have to spend unnecessary time into consolidating your books and accounting for the tax year during tax season. With this bundle, you get help finding the best business deductions, help in keeping up with your quarterly tax payment, a mobile app to track your income on the go on your iPhone, and one-click exporting of your Schedule C forms to TurboTax. Then once it’s time to file, you don’t have to pay extra for tax software because TurboTax Home & Business with Federal and State e-file is included free with your active membership. All new customers also get a discount off their 3-months of membership – 29% off. That helps drop the price down to just $12.00 per month. Then after that, the monthly fee goes up to $17.00 per month. 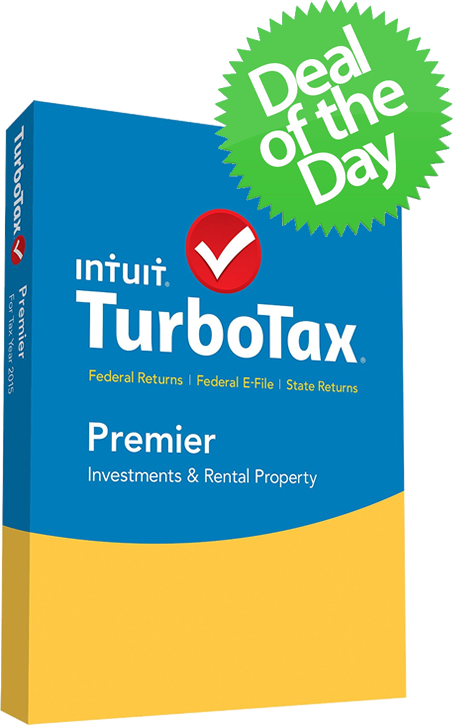 But given that TurboTax Self-Employed costs around $150 to file if you have a State return to file, factoring in the cost of QuickBooks if you were to get Premier 2019 (retails for $499.99), the QuickBooks Self-Employed Tax Bundle option is a pretty good option. Just keep in mind that while the introductory offer seems to be an ongoing it is is subject to change or end at any time. In terms of cancelation, the good new is that you can cancel at any time. That means if you find out this bundle is not the best option for you, or that you no longer need it for your business, then simply cancel your subscription at any time and you’re good to go. Any other QuickBooks-TurboTax bundles available? There doesn’t seem to be any other offers available for 2019 coming from TurboTax (as least as far as we can tell). Last year Amazon had a TurboTax Home & Business and QuickBooks Essentials Bundle offer but that since has ended (it was only $20.00 off if you would buy the 1-year subscription of QuickBooks Essentials along with Home & Business). However we are keeping an eye out for any new bundle offers and will be posting the details here if anything else is released this tax season. We welcome any of your questions or comments – Just leave your thoughts below. QuickBooks Self-Employed Tax Bundle are both product working on-line ? Yup – These are both for the online versions. I have already bought (from Staples) and filed my TurboTax for 2015 but want to buy the QuickBooks bundle for this year and beyond. Can I still get QuickBooks at the bundled price? Unfortunately not… All the bundle deals specifically state that both copies have to be purchased together in order to qualify. We're tracking all of the latest TurboTax deals to help you save up anywhere from 20% all the way up to 40% on your tax software order. Just select one of the options above to see all of the offers currently available on the most popular TurboTax programs for 2019.